Sliced bread, rolls, bagels, pitas and other bread products can provide you with nutrients like B vitamins and iron. 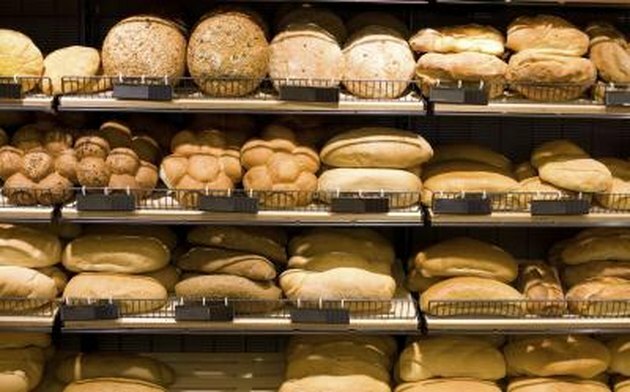 In large amounts, though, bread may supply more calories than your body needs, leading to weight gain. How much weight you can lose by avoiding eating bread depends on how much bread you currently eat. Just eliminating your morning toast won't help much, but if eating less bread leads to a significant calorie reduction in your daily diet, this approach may help you lose weight. While bread isn't particularly high in calories, if you eat bread with every meal, its calories add up quickly. To know how much weight you can lose by avoiding bread, you'll need to know approximately how many calories you consume from bread each day. White bread contains 266 calories per 100-g serving or 80 calories per 30-g slice, while 100 g whole-wheat bread contains 247 calories and a 30-g slice contains 74 calories. A 57-g English muffin provides 134 calories and a 60-g, or 6 1/2-inch-diameter white pita comes in at 165 calories. Reducing your calorie intake by 100 to 500 calories daily, as well as being physically active for 30 to 60 minutes daily, is a good start toward losing weight, advises University of Hawaii nutritionists Drs. Alan Titchenal and Joannie Dobbs. If you typically eat a slice of bread with breakfast, an English muffin as a mid-morning snack, a pita at lunch and another slice of bread with dinner, you're consuming around 454 calories daily or 3,178 weekly from bread. You need a calorie deficit of around 3,500 calories to lose 1 lb. weekly, so if your current caloric intake is just enough to maintain your weight, cutting 3,178 calories weekly can help you lose almost 1 lb. each week. If you're very overweight, you can safely lose up to 2 lbs. every week by cutting 3,500 calories from your usual weekly calorie requirement and burning another 3,500 calories weekly through exercise. To estimate your daily caloric needs, select a weight halfway between your current one and your ideal one and multiply the number by 10. Add on 20 to 30 percent of this number if you're inactive or 50 percent if you're moderately active. Cut 500 calories from your total. If you can't cut 500 calories daily by eliminating bread from your usual diet, consume less soda, sweets, potato chips and other nutrient-poor items. Aim to burn another 500 calories daily through exercise like cycling, step aerobics, dancing, vigorous sports or other activity. Carbohydrate-rich foods help your body produce glucose, which provides energy for your body and brain. For adequate nutrition, carbohydrates should make up at least 45 percent of your calorie intake, according to experts at the Centers for Disease Control and Prevention. If you cut bread completely from your diet, you may need to increase your intake of healthy carbohydrates. In addition to fruits and vegetables, grains are a rich source of carbohydrates. Half of the grains you eat should be whole-grain products, such as brown or wild rice, oatmeal, muesli and millet, rather than refined-grain products like white rice, non-whole-grain pasta, pretzels and pastries.